The control of erosion and resultant flow of sediment into a water body is important from many aspects. Not only does the sediment reduce water depth and clarity, the fine material gives us muddy coves and smothers fish habitat and nesting sites. In addition the sediment carries with it Phosphorous, a limiting nutrient that when present in high volume promotes the growth of plant life such as milfoil and makes conditions ripe for algae blooms. As the algae proliferate and then die they release the phosphorous back into the water starting a revolving cycle that tends to get worse. This also causes a depletion of oxygen in the water column reducing available fish and aquatic creature habitat. 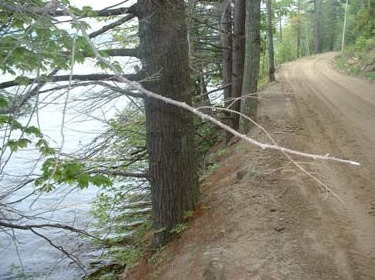 At the beginning of this erosion control effort in 2002 and 2003 a complete study of every property, Right of Way, and private road in the Little Sebago Watershed was conducted including photos, site evaluation, and recommendations for each property. The information was reviewed and graded by DEP and CCSWCD engineers who created spreadsheets of low, medium, and high priority sites based on observed erosion and projected soil transport to the water body. This information was used to determine properties to be addressed as the work of writing grant requests was developed. Many of you probably remember this process as over 150 of you to date have been involved in projects on your personal properties to cure erosion issues and reduce run off and sediment flow to the lake. Additionally there have been countless projects on private roads and ROW’s around Little Sebago including culverts, stone armoring of ditches, rubber razors, regarding, and tarring. A big Thank you with appreciation goes out to all of you who have been part of the efforts to date. At this time it’s important to let all of you know that we are presently in the fourth and probably final round of grant funding to help cut erosion and reduce sediment flow to our lake. The CCSWCD has been successful once again in procuring federal 319 clean air and water act funds to use as a match to our own funds and work to help us maintain our Little Sebago water quality. The grant was initially to run through February of 2016 but the work time has been extended through Dec of 2016. This present project as it is defined under the grant is expected to do almost $170,000 worth of work on roads and at residences which will reduce sediment transport into the lake by 60 tons/year. This will bring the total dollar value of erosion and sediment control work done in the Little Sebago watershed to nearly $700,000 and potentially keeps over 250 tons of sediment annually out of our lake. The thrust of this grant will be to address at least 12 medium and high priority private road sites with a 50/50 match of grant funds to road association work and financial contribution. Several projects are already determined but there are still some spots open for additional requests. In addition CCSWCD is working to develop a cooperative of road associations that could work together as a buying group to get better rates on materials and contractors for the regular year to year maintenance. CCSWCD will also help road associations develop long term operation and maintenance plans based on Best Management Practices and proven road care methodology. This grant also addresses residential issues of erosion. CCSWCD will provide about 30 full property assessments looking at all property aspects to develop a plan for the homeowner noting the erosion issues and needed BMP’s to help cure the problem. A report will be provided with prioritized recommendations including materials, methods, possible contractors, etc. There is also free technical assistance available to help property owners determine the best course of action for self directed erosion reduction projects. LSLA has determined that they will help residential property owners accomplish the needed work by providing a limited 50/50 cash match program with a maximum of $500/project. Additionally CCSWCD will help homeowners with projects by making plants for buffer zones and rain gardens available at a discount from local greenhouses. They also have a program this year for homeowners to be able to buy erosion control mulch at a reduced rate. For those of you who think you might have an erosion or sedimentation issue on your property or road nearby and would like some help determining how to proceed; now is the time. There are still opportunities to get involved in this initiative, improve the looks and performance of your property, repair your road, have plans and permits provided, and get part of your costs covered as well. The request forms and requirements are very straight forward. Much of the work to reduce erosion, especially on residential properties, is simple to understand and often can be done with hand tools. It is in the best interest of all of us and birds, animals, amphibians, and fish that we share Little Sebago with to take care of the lake that is part of our front yard. Please; get in touch and ask some questions. All of us at LSLA, DEP, and CCSWC will be happy to provide guidance and direction.